The home on Main Street in Cary where John J. Smith and his family lived after moving to town from the farm. John is on the porch, his daughter Laura and an unknown suitor are standing on the lawn. 12. Johann Carl Joachim SCHMIDT was born on 27 Dec 1848 in Grischow, Pommerania, Germany. Changed name to Smith. December 21, 1888 -- Card of Thanks. The undersigned desire to express their heartfelt thanks and appreciation of the many kindnesses extended by the neighbors, who so generously tendered their valuable services in various ways, at the recent severe illness of Mrs. Barbara Smith. In all the vocabulary of the English language the most fitting words can but faintly express the deep sense of gratitude which we feel ourselves indebted. Again we thank you. J.G. Smith, Geo. E. Cary, Ill., Dec. 12, 1888. February 1, 1889 -- Emma, the three year old daughter of John J Smith, died about midnight, Jan 10th, and was buried on Saturday, Jan 12th. The little one was an unusually bright child for one of its age. It suffered greatly and finally succumed to that fatal disease Diphtheria. The other children are well. February 22, 1889 -- Gotlieb Smith returned to his home in New Ulm, Minn., last Monday night after a sojourn of one week. He left his mother not any more improved in health than when he came… John J Smith’s little seven-year son died of diphtheria last Sunday and was buried Monday morning. This makes the second child he has lost by the same disease since New Years. The year 1889 will be a sad one indeed in the memory of the parents. March 15, 1889 -- Card of Thanks. To the many friends and neighbors who have aided us during the long siege of sickness and who have sympathized with us in our sad bereavement in the death of a loving wife and mother, we return our heartfelt thanks, and pray you may be abundently blessed for your many kindnesses to us. Also to those who brought the beautiful floral-offerings, and to those who volunteered their services in singing, do we tender our sincere thanks. J. G. Smith, Mrs. Barbara Smith, Gottlieb Smith, Geo. E. Smith, A. H. Smith. When J. J. Smith moved his family to the new home on Main Street in Cary, he rented the farm for a few years to various tenants. 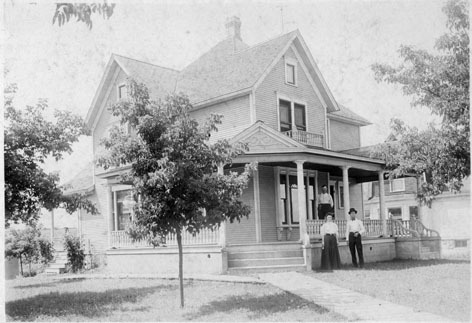 His son Arthur and young family lived there for a while about 1908. John placed the following column in the Crystal Lake newspaper in early 1903. John J. Smith, having rented his farm, will sell at public auction, on his farm, 2 miles north of Cary, 4 miles east of Nunda, commencing at 10 o’clock a. m., sharp, on Thursday, Feb. 5, 44 head of cows—a fine young dairy, raised on his farm; 5 horses—1 gray mare, 10 years old, weight 1,300; 1 bay horse, 9 years, weight, 1,300; 1 chestnut horse, 13 years old, weight 1,250; 1 brown horse, 7 years old, weight 1,200; 1 bay gelding, 3 years old, weight 1,300; Rock Island hay loader, hay rake, 3 sets of double harness, 2 nearly new, scales, planker, large kettle, grindstone, lumber wagon, truck, wagon, milk wagon, 2 bob sleighs, Deering grain binder, nearly new, corn harvester, nearly new, Milwaukee mower, 2 sulky cultivators, nearly new, 5-tooth cultivator, corn planter with check rower, 2 walking plows, riding plow, pulverizer, 2 harrows, 4-horse power, nearly new, grinder, hay tedder, corn sheller, 2-horse tread power, feed cutter, 40 milk cans, 40 tons corn in crib, 25 bushels of seed corn, 3 stacks corn stalks, 800 bushels good seed oats, 100 bushels of rye, 30 tons of tame hay in barn, 50 grain bags. Good free lunch at noon. H. B. Throop, auctioneer: L. E. Mentch, clerk. J. J. Smith and family moved into their new residence the first of the month. John Arps will occupy the Boomer house, vacated by Mr. Smith. - Nunda Herald, Feb. 2, 1905. John J. Smith died on 13 Nov 1932 in Cary, McHenry, Illinois. John J. Smith of Cary died Sunday night at 9:30 o'clock at his home there, being 83 years, 11 months and 16 days old. He was born Dec. 27, 1848 in Germany and after coming to this country followed farming as an occupation, having retired from this work. Funeral services were held this afternoon at Cary with interment in the cemetery. The Masonic lodge was in charge of the services. Mr. Smith, early in life, learned the wagon manufacturing business in Germany. Later, he entered the German army and became a member of the Empire Guards. He participated in the Franco-Prussian war, serving under the then Lieutenant Von Hindenburg, now president of the German Republic. Mr. Smith came to the United States in the spring of 1872, living for a time with an uncle here. Soon afterwards, he moved to Cary where he lived most of his life. He was married to Barbara Smith on June 19, 1878, who with three children survive him. A sister, Mrs. Robert Radke, resides here. A son and a daughter died in 1889. Mr. Smith was a member of the Crystal Lake Masonic and Odd Fellows fraternities, these organizations having charge of the funeral. John J. Smith, a prominent resident of McHenry county, died at 9:30 o'clock last night at his home in Cary. He was born in Pommersi, Germany on December 27, 1848, the son of John and Fredricka Smith. Young Smith had learned the wagon manufacturing business in Germany, and later had entered the German army, a member of the Empire Guards, and participated in the Franco-Prussian war, serving under the then Lieutenant Von Hindenburg, now president of the German republic. In the spring of 1872 Mr. Smith came to the United States, and lived with an uncle at Crystal Lake. Soon after he moved to Cary, where he had lived most of his life. On June 19, 1878, he was married to Barbara Smith, daughter of John George and Barbara Lang Smith, who survives him. Three children also survive him, Mrs. Alvina Smith Melahn of Dundee, Arthur Smith of Freeport, and Mrs. Laura Smith Johnson of Cary, and a sister, Mrs. Robert Radke, who resides at Crystal Lake. There are 12 grandchildren, and six great-grandchildren. One son, John, and a daughter, Emma, died in 1889. Mr. Smith was a member of the Nunda A. F. and A. M., of the Woodstock chapter of the Royal Arch Masons, and of the Crystal Lake lodge of Odd Fellows. Funeral services will be held Thursday afternoon at 1 o'clock from the Methodist Episcopal church at Cary, the Masons and Odd Fellows to have charge, with the Rev. Barhomer* officiating. Crystal Lake Herald, Nov. 24, 1932 page 5. Last week we laid away the mortal remains of one of the oldest citizens of Cary. His passing brings to mind the old, old questions of "What is a man's worth to his group", "What is a man's responsibility to the community", and "When and how does he learn to answer these questions?" When a man lives to 84 years and preserves his powers, maintains his interests and shares with his fellows to old age it is a circumstance worthy of consideration. When death closes his record there is a lesson in his life for others. When his race is run may we profit by giving thought to what he accomplished? At the funeral the preacher could only talk the usual generalities. The service of the fraternal organizations was limited to the ritual which is the same for poor, better or best. An aged man, a long local life, a constant citizen -- these seem to deserve some special word of appreciation. Mr. Smith was one of the first men I can remember from the days of childhood. In my earliest recollections of him he was a giant of a man with a busy forceful method about his work and a blunt but not unkindly manner. I heard him rated as a man respected. As years passed I noted how he carried out his plans and made goal after goal in his program. In his later years I was privileged to live near him again and to note how his decline in years attested to the wisdom of his prime. Germany was always -- Fatherland. In the U.S.A. he brought and preserved what was most practical and useful of his early training and inheritance of German characteristics. He knew that conditions of life there limited his ambitions. He became therefore one of those with the proper will to take a part in developing this country. He was unselfish and liberal in his relations with his country men. He was firm in his loyalty to his adopted country. His influence and leadership undoubtedly made good citizens more promptly of the newly arrived Germans. Many were coming in those days and there must be many here now to be thankful for his interest in them. His grasp of our American problems enabled him to show them how discontent could be solved by their own attitude and personal efforts. He overcame the repressions and curbs put on European peoples. He had caution and reserve as a result of training under arbitrary orders during his youth. But he overcame the handicap much more than the ordinary imported citizen. New opportunities meant new efforts and he kept alert. He selected farming as an occupation but he was not content with simple labor in the fields. He was observant and sought progress. He developed new methods. He was rated "a good farmer". He felt that his standing in the community depended on such industry and intelligence in his work. His financial reward and comfort proved his plan. It was not all luck which gave him comfort in his declining period of life. He seemed particularly actuated by a desire to be free of obligations and to be self-supporting even in old age. He seemed to fear life's uncertainties and the limit of working days. He did not appear to desire "big money" or to plan great and unusual pleasures. He went along on the laudable expectation of never being a burden to others. That particular part of his foresight was or may be called his donation to our social economy. He was consistent in that he conserved his resources. He used even his later years for doing things for himself. This was a desirable purpose and aided in keeping effective his will to do and share things. Sometimes I told him that because of super-health he was unfair and intolerant of the rest of us with our kinks and signs of wearing out. He only laughed and said it was work and keeping an interest in life that gave good health. He was greatly given to the thought on the contributions of human endeavor in the activities of a community. He realized how we all depend on each other and yet he had a pride in the strongest individuals. In his later years he kept active and there is many a young man in Cary who now appreciates good advice given by Mr. Smith during his service as school janitor. Likewise his stalwart efficiency as thistle commissioner in the township gave him an opportunity to preach good farming and his coaching and advice helped many a farmer. He began some time back to anticipate death. He did not seem entirely able to resign himself to the natural phenomena of a mortal end. It seemed like a part to play which he had not rehearsed. He had no dread of the final curtain. However he could not anticipate it except as a strange adventure. Out under the trees in the back garden we often conversed on life and its purposes. He admitted that years alone do not bring an understanding of such things. The inner mysteries of Faith seemed to uncommon for him to master and he just trusted and laid aside his questions. My outstanding memory of him will be his constant desire to speak well, or not at all, of his fellowmen. An ordinary simple citizen has gone to his rest but his record will remain to prompt others to use life for a purpose. Out of town folks who attended the funeral of John J. Smith last Thursday: Charlie, Otto, Henry and Robert of Litchfield, Minn; Mr. and Mrs. Fred Melahan, Mr. and Mrs. Chas. Bell, Mr. and Mrs. Fred Kurt, Mr. and Mrs. Alfred Hawley, Elgin; Mr. and Mrs. Schreder, Lombard; Mr. and Mrs. Alvin Bau, Elsie, Doris and Robert Melahn, Mr. and Mrs. Herman Melahn, August Egler and son, Dundee. Mr. and Mrs. A. A. Smith, Mr. and Mrs. J. G. Feld, LeRoy Smith, Freeport, Ill; LaVerne Smith, Mr. and Mrs. Meyer, Mrs Budzisk, Mrs. Ehlert, Mr. and Mrs. Albert Miller, Mr. and Mrs. John Einbecker, Gussie Miller, Chicago; Mr. and Mrs. A. D. Church, Mrs. A. Fletcher, Mrs. Bessie West, Mrs. H. Decker, Elsie Melahn, Barrington; Nunda L.O.O.F., Justin Rebekah Lodge, Crystal Lake. 13. Anna Katharina Barbara SCHMID was born on 16 Dec 1858 in Cary Station, McHenry, Illinois. She died March 4, 1947 in Cary, McHenry, Illinois. Crystal Lake, Ill.
Mrs. Barbara Smith, well known in Cary, passed away Tuesday morning after a short illness at the home of her daughter and son-in-law, Mr. and Mrs. L. Johnson, at the age of 89 years. She was born in Cary, December 16, 1858 and was the widow of the late John J. Smith, who preceded her in death 15 years ago. She is survived by two daughter, Mrs. Alvena Melahn of Dundee and Mrs. Laura Johnson of Cary. Three children Emma, Johnnie, and Arthur, preceded her in death. She had twelve grandchildren, thirteen great-grandchildren and one great-great grandchild. She will be at rest in the Gilbert's Funeral home at Crystal Lake and will be taken to the Cary Methodist church Thursday at 12 o'clock where she will be in state until 1:30. Funeral services will be held Thursday afternoon at the Cary Methodist church, interment at Cary cemetery. Funeral services for Mrs. Barbara Smith were held Thursday afternoon from Gilbert's Funeral Home to the Methodist church. Rev. Draper Bishop officiated. D. Griffith rendered a hymn, "The Old Rugged Cross", after which the Relief Corps of Barrington of which she was a member held their service. Two beautiful numbers, "Abide With Me," and "In the Garden", were sung with Mrs. S. Boz at the piano. Interment at Cary cemetery. Mrs. Smith was born in Cary and was well known, and held a large circle of friends. She will be missed by all who knew her. Sympathy is extended to the family of Grandma Smith. Mrs A. Hawley and daughter, Mrs. Herbert Schrader formerly of Cary, Mrs. F. Genereaux., Mrs. Munshaw of Elgin attended the funeral of Mrs. Barbara Smith Thursday afternoon. She signed a will on 8 May 1933 in Cary, McHenry, Illinois. FIRST, I order and direct that my Executrix hereinafter named pay all my just debts and funeral expenses as soon after my decease as conveniently may be. SECOND, After the payment of such funeral expenses and debts, I give, devise and bequeath to my beloved son, Arthur A. Smith, a reed rocking chair; to my beloved daughter, Alvena Melahn, the book case now in my home; all the rest and residue of my property and all money and notes made payable to me, I give devise and bequeath to my beloved daughter, Laura Johnson. Lastly, I nominate and appoint Laura Johnson to be Executrix of this, my last Will and Testament. I hereby revoke all former wills and codicils by me made. This Instrument was on the day of the date thereof signed, published and declared by the said testatrix, Barbara Smith……..
i. Alvina Louisa SMITH was born in 1879. She died in 1958.
ii. 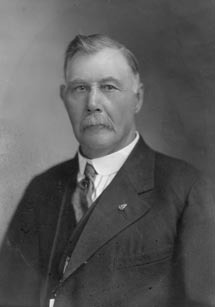 John George SMITH was born in 1882. He died in 1889.
iv. 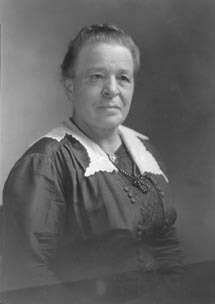 Emma Martha SMITH was born in 1886. She died in 1889.
v. Laura Augusta SMITH was born in 1888. She died in 1966.